Allergy bedding items have been specially created to prevent dust mites, pet dander, other allergens and even bed bugs from getting in or out of your bedding. People spend one-third of their life’s sleeping. So, it’s an important to invest in allergy-proof bedding. That can significantly decrease your allergy symptoms and warrant that you get a good night’s sleep. If you wake up in the morning with a stuffy nose, runny, puffy or itchy eyes or a cough it is the last time for you to consider using allergy bedding. 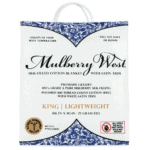 Luxurious Mulberry West Silk Blanket is made of the greatest quality mulberry silk to naturally resist dust mites, bed bugs, and other familiar bedroom allergens. Available in two sizes – 90 in X 106 in and 94 in x 90 in. This blanket features a delicate and elegant satin trim and makes for a fabulous layering piece or a lighter weight alternative to a coverlet. The blanket is filled with 75 grams of Grade-A mulberry silk which is known to be stronger than iron wire with the same dimension while also retaining flexibility and elasticity. 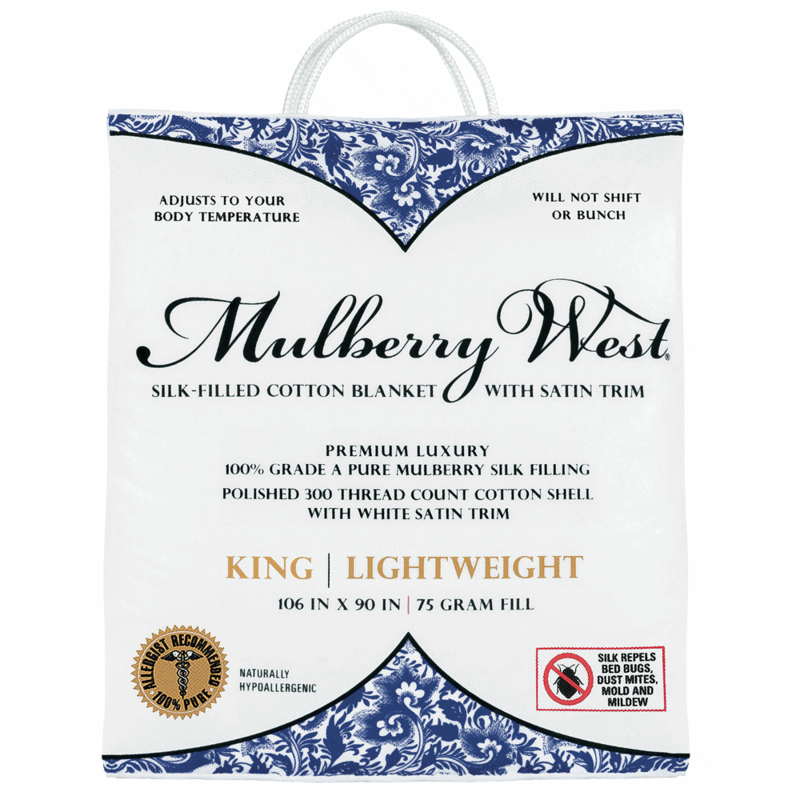 Along with naturally offending allergens, Mulberry West hypoallergenic blankets keep you warm by minimizing temperature changes. This blanket offers a lightweight veil of warmth without overheating you. It also eliminates moisture 1.5 times better than plain cotton. Its breathability and moisture absorption capability stay you comfortable while you sleep. Odor-free. This blanket won’t give off an unpleasant odor. Naturally repels allergens such as dust mites, bed bugs, and mold spores, so you can nap comfortable and symptom-free. Mulberry silk blankets naturally absorb moisture. You may need more sizes. Can’t wash in the washing machine (can degrade the quality of the silk). Crescent Moon Alpaca Wool Pillow is made from a combination of 30 percent sheep wool and 70 percent alpaca wool. The unique batting is naturally porous, withholding allergens like dust mites and mold from growing inside. Its organic cotton cover is also naturally hypoallergenic. 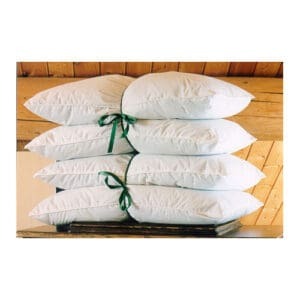 These pillows are a soft, durable, and eco-friendly alternative to down and allergen-riddled synthetics. Crescent Moon pillows are free from pesticides, bleaches, and dyes, synthetic materials, and irritating fumes. Eco-friendly. This pillow is all natural and safe for the environment. 5-Year Warranty. Your pillow is guaranteed to be free of faults in workmanship for five years. Available from two sizes and three density options. BedCare Classic Allergen Mattress Covers are made of 100 percent stretch polyester knit combined with an ultra-thin urethane membrane. Materials are soft and delicate. These covers are an effective shield against dust mites, mold spores, and other bedroom allergens. The material is easy to care for. Can wash in washing machine and dry it in a clothes dryer. The material stretches to suit the dimensions of your mattress. BedCare All-Cotton Allergy Mattress Covers are made of 100 percent pure cotton fabric that is highly breathable and won’t store heat like traditional allergy mattress covers. All-cotton weaving forms a tiny pore size of 2.6 microns. Most common allergy triggers are larger than this size and won’t be able to get through. With daily use, you’ll notice a decrease in your allergy symptoms and an increase in quality sleep. Recommended by allergists and doctors for better protection against allergens. Keeps you cool and won’t store or transmit heat. Can wash in washing machine and dry in a clothes dryer. Each cover is made and hand-inspected in the USA. Available in 22 sizes, from crib to California King. Posted in Allergy Bedding and tagged Allergy Bedding, blankets, Mattress covers, Pillow covers, pillows.